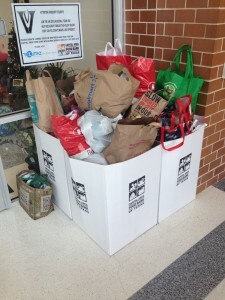 ZumaOffice.com and Vandegrift High School recently kicked off their third annual Holiday Food Drive to collect much needed food for the Capital Area Food Bank during the holiday season. Last year’s drive raised an amazing 2850 lbs. of food for hungry Central Texans during the holiday season. The Vandegrift Boys Basketball Team, the school’s UNICEF Club, and the Student Council are all working together to raise awareness of the food drive and work towards another successful year. Four Points Middle School is also part of the food drive this year, (they collected significant donations on their own last year). Last year’s food drive collected an incredible 14 pallets of food! The holiday season is a very busy time for the Capital Area Food Bank, so the donations come at a time when families struggle between buying food, paying for housing, and then possibly having something left over for Christmas. CAFB studies show that 34% of the food bank clients are children and teens, and 93% of the food bank clients are not homeless. Last year’s donations equaled almost 2,500 meals! Giving back to others and making a difference is what life is about, and what better time to do that than during the holiday season. Donations boxes are at VHS in front of the cafeteria, and at the front of the school across from the main office. If you’re in the area, grab some canned goods or non-perishable items from your kitchen and drop of a donation for a great cause. The food drive runs until Friday December 19. Do good work with Vandegrift High School, Four Points Middle School and ZumaOffice.com! This entry was posted in Charities and tagged Capital Area Food Bank, Holiday food drive, office supplies, Zuma. Bookmark the permalink.